InvestSMART's free TrailCap slices the cost of financial products where trailing fees are paid. Summary: Beyond a $300 per annum minimum, InvestSMART will rebate 50 per cent of trail commissions. Key take-out: On an investment balance of $1 million, the rebates would likely run into the thousands of dollars each year. Key beneficiaries: General investors. Category: Investment strategy. Australian investors are collectively paying billions of dollars annually in costly trail commissions to financial advisors, planners and brokers on everyday financial products. A report on recurring fees in financial services commissioned by InvestSMART and conducted by research firm Rice Warner found that banks, brokers and advisors are collectively being paid more than $3 billion in trail commissions annually. Trail commissions are paid by investors on an ongoing basis, on a broad range of financial products including managed funds, superannuation and life insurance products, and they can literally add up to thousands of dollars every year. For some products – such as insurance – commissions can be steep: 10-30 per cent on average and as high as 130 per cent of the first year's premium. Commissions on superannuation and managed funds are not as high but with the large amounts under management, typical of an investor nearing retirement, the fees do add up. While that may not come as a total surprise, given that full disclosure by financial providers of fees and commissions is mandatory in their financial product disclosure statements, what many investors don't realise is that in many cases they can actually claim them back. InvestSMART's free service TrailCap works with many financial products where trailing fees and commissions are paid. 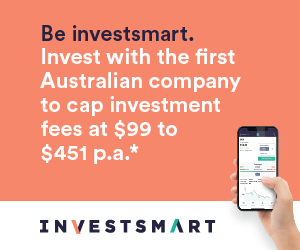 Rather than go through a retail financial planner or broker who will receive fees and commissions on products, an independent investor can nominate InvestSMART as their broker, and get a rebate on commissions paid. Typically, an InvestSMART client will have worked with financial planners in the past. But even those who don't use a financial planner – purchasing units direct from a managed fund, for example – can still get extra rebated dollars through InvestSMART from commissions that otherwise would have been paid to an external party. It's taking advantage of a system that otherwise doesn't benefit the independent investor. In return for doing so, InvestSMART will rebate 50 per cent of trail commissions beyond a $300 per annum minimum, with rebates then returned as an annual payment. The overall commission savings quickly add up. Here's an example of the potential commission savings that can be achieved, even on relatively low investment balances. On an investment balance of $1 million being charged a 0.5 per cent trail commission per annum, or $5000 every year, the rebates available will run into thousands of dollars each year. Trail commission rebates can be paid, either as a cheque or via electronic fund transfer (EFT). To receive your TrailCap payments via EFT to an Australian bank account – just complete the EFT section in the online application form.